The Navy Cross is awarded to First Lieutenant Jonas H. Platt, United States Marine Corps, for extraordinary heroism in action near the Bois de Belleau, Chateau-Thierry, France, June 6, 1918. Seriously wounded in the leg early in the engagement, Lieutenant Platt continued to direct the operations not only of his platoon but of another. He charged and drove off the crew of an enemy machine gun, supervised the disposition and digging in of a large part of his company and yielded command only when exhausted from pain and loss of blood. NOTE: He may be a relative (perhaps Father) of Jonas Mansfield Platt, Lietuenant General, United States Marine Corps. 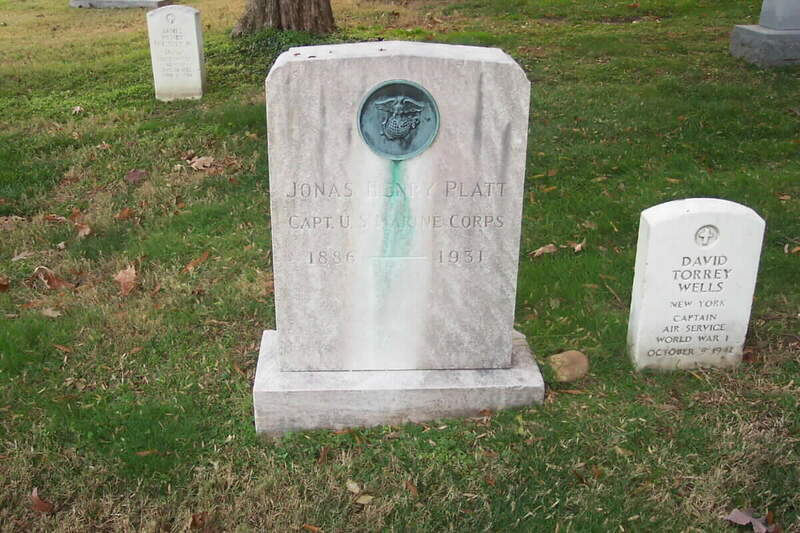 "Most Modest Man In The Marines"
WASHINGTON, July 30, 1931 - Captain Jonas Henry Platt, United States Marine Corps, of New York City, died in the Naval Hospital today at the age of 45, after a long illness. Captain Platt was one of the outstanding heroesof Belleau Wood, where he was wounded. For his bravery in action he won the Distinguished Service Cross of the Army and the Navy Cross,. "For extraordinary heroism in action near the Boisde Belleau, Chateau-Thierry, France, June6, 1918. Seriously wounded in the leg early in the engagement, he continued to direct the operations not only of his platoon but of another. He charged and drove off the cew of an enemy machine gun, supervised the disposal and digging-in of a large part of his company and yielded command only when exhausted from pain and loss of blood." Captain Platt served in Haiti from January to June 1925, when he was ordered to Philadelphia as Officer-in-Charge of the Marine Recruiting Bureau. In April 1929 he was transferred to Washington as aide to the Major General Commandant. In September 1930 he was ordered to the Marine Barracks, Quantico, Virginia, as a student in the Field Officers' Course. He entered the Naval Hospital here on June 3l last. Before he enlisted on the day that the United States entered the war, Captain Platt had been a reporter and rewrite man on the Evening Mail and other New York newspapers and managing editor of the Newspaper Enterprise Assosciation, with headquarters in Cleveland. When he returned from overseason the transport Van Steuben on July 28, 1919, he lived up to his reputation as "the most modest man in the Marine Corps." Seeing a group of reporters waiting for him as hecame down the gangplank, Captain Platt fled, and escped by leaping on a ferryboat just as it pulled out. The interviewers didn't catch up with him until the next day and his entire account ofhis exploits was "I spent five months at Chatteau-Thierry and five months in a hospital." Several reporters managed to hold him while his photograph was taken. "How did you get the D.S.C.? "someone asked him. "I don't know how I got it,"he said. "I don't deserve it. I'm no hero I'm just another Marine coming home." WASHINGTON, July 31, 1931- Funeral services with full military honors for Captain Jonas H. Platt, U.S.M.C., will be held in Arlington National Cemetery at 10:30 A.M. tomorrow. Lieutenant Commander Clinton A. Neyman, Chaplain Corps, will officiate. The honorary pallbearers will be Captains Robert C. Kilmartin, Glenn C. Cole, Carl S. Schmidt, William P. T. Hill, Charles T. Brooks and ThomasE. Bourke, all of the Matrine Corps.